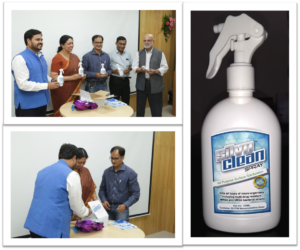 Product Description: It is an all -purpose surface sterilization spray for hospital and industry settings (Silvoclean). The formulation is made up of a proprietary formula consisting of silver nanoparticles, well known for its antimicrobial effects. The formulation has been shown to be effective against bacteria, spores, and virus, making it twice as effective as current sterilization sprays, while being 10 times safer than current surface sterilization agents. The formulation is designed have a longer residence time on surfaces, saving you from repetitive application.